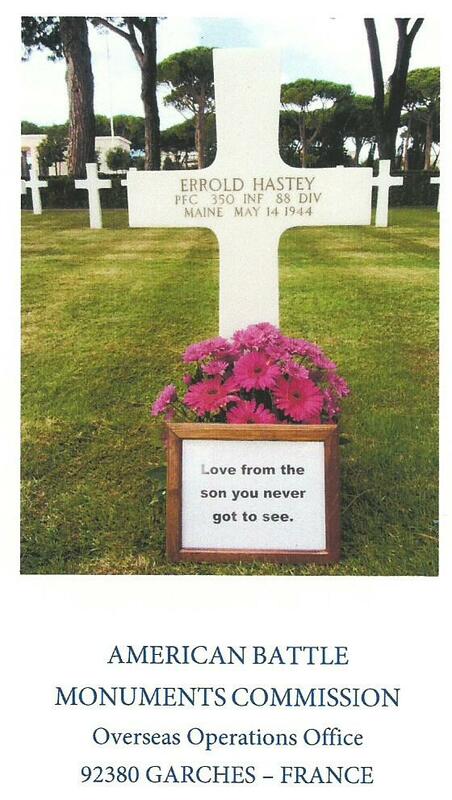 Our own George Cropley was 3 months old when his Dad was killed by a German sniper in Italy. 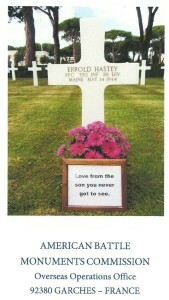 PFC Errold Hastey is buried in the WWII Military Cemetery outside of Rome, Italy. On special days, George orders flowers to be placed on his father’s grave from”The son you never got to see”. 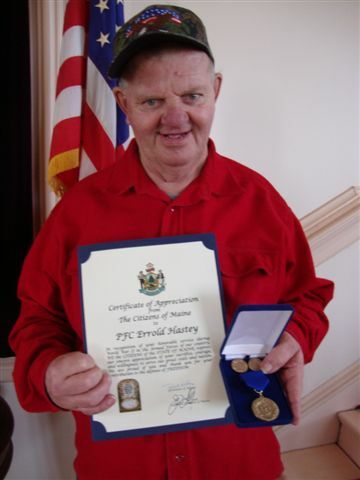 George Cropley of Cherryfield attends many of our Legion events and proudly wears the Gold Medal presented to next-of-kin of military personnel killed in the line of duty by the State of Maine. George has visited the Rome/Sicily Military Cemetery in Italy to see his father’s grave and several times a year has the grave decorated. The American Battle Monuments Commission which maintains our military cemeteries world-wide sends a nice photo of the decorated grave to George and we were very impressed with the care for the graves we saw during our visit. 1LT Peter Duston, USA-ret for George ! Accompanied George on Memorial Day a number of years ago. 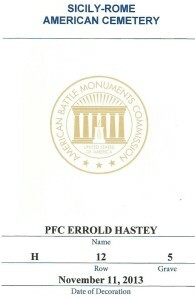 Embert L. Grant was born in Harrington in 1925, the only child of Leon C. and Henrietta Young Grant. 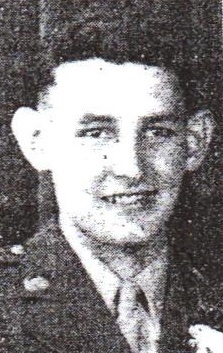 He was a graduate of Columbia Falls High School, Class of 1943 and enlisted immediately into the US Army. Following infantry basic training, we think at Camp Croft, SC, Grant was assigned to Easy Company, 318th Infantry Regiment, 80th Division. The Division landed in France at Utah Beach on 5 August 1944 two months after D-Day. Considered the “Work Horse” of General Patton’s 3rd Army, PVT Grant and the 80th played a key role in the “breakout” at Avranches and the famous “Dash” across France until gas and supplies ran out. Following the “Bloody Moselle Crossing, by 8 November, the Division was within 5 miles of Saarbruecken, Germany meeting increased enemy resistance resulting from Hitler’s “No retreat” order. The end of November 1944 found Easy Company and the 318th Infantry in constant daily combat in the St. Avold area as the preparations were being made for the breach of the German border. On 29 November, PVT Grant was seriously wounded and on 4 December 1944, he died of his wounds in a US Army Hospital in France. Embert L. Grant was 19 years old. 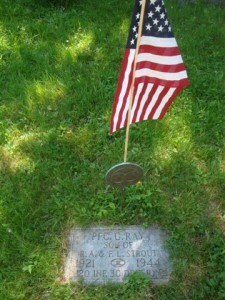 His body was returned to the States following the War and was buried with full military honors in the family lot in Harrington in 1946. A large color photograph of his burial hangs on the wall of the Maine Military Funeral Honors Office in Augusta forever remembering his ultimate sacrifice. 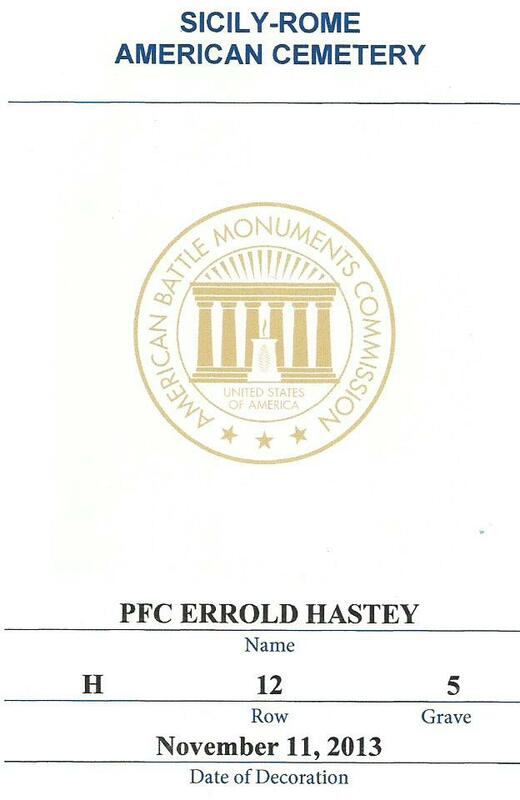 Since we were unable to find any local family, Kevin Woodard, Commander of the Harrington Veterans of Foreign Wars Post received the Gold Star Medal and hold it in trust that Private Embert Grant will always be remembered near where he was born. Philip Farnsworth Grant was the son of Mr. and Mrs. Fred Grant, and a 1934 Graduate of Cherryfield Academy. 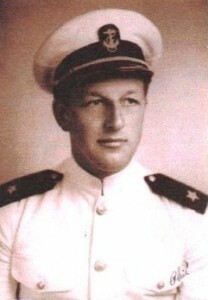 After graduating from the University of Maine, he joined the Navy in 1941, training as a carrier pilot and was assigned to the USS Hornet in the early days of the Pacific War. He distinguished himself during the Battle of Midway flying the Douglas Dauntless Dive Bomber (SDB) by his aggressive attacks on the enemy ships and by landing on a beach to rescue a fellow pilot who had to ditch his plane. For his exploits, he was awarded the Distinguished Flying Cross by Admiral Nimitz, the Pacific Fleet Commander. Several months later in October, a major Japanese naval force moved into the Guadalcanal sector with the objective of cutting allied shipping lanes to Australia. Outnumbered 2 to 1, the American fleet met the invading forces in the Battle of Santa Cruz Island. LT Grant’s VB-8 Wing consisting of 8 SDB’s went up with other wings of dive bombers to bomb and strafe the Japanese task force of carriers and war ships. Outnumbered by a vastly larger enemy force of Zeros and dive bombers, the Americans fought hard in what became known as the most intense two hour air and carrier battle of WWII, a battle that cost the Americans dearly but kept the invading Japanese from threatening the vital Richardson Airfield on Guadalcanal. LT Grant took off from the Hornet with the first strike force at 0755 hours on the morning of 26 Oct 1942. Approaching the enemy ships, LT Grant’s flight commander’s plane’s engine seized up and he went into the water at 0926 and LT Grant was shot down approximately 4 minutes later at 0930 hours. He and his gunner were never recovered. LT Philip F. Grant will always be 25 years old. His name is inscribed on the Wall of the Missing in the American Battlefield Monuments Cemetery in Manila, the Philippines where they remembered him yesterday at their Memorial Day observances. LT Grants nephews, Wayne and Philip Grant received the State of Maine Gold Star Medal from the grateful people of Maine for his ultimate sacrifice. Signalman 3rd Class Kenneth Allen Sproul was born 30 Sep 1923, son of Allen and Estah Sproul and the twin of Katherine Sproul Bickford. A 1941 graduate of Cherryfield Academy, Kenneth was on his third convoy trip overseas serving as a US Navy Guard aboard the Liberty Ship, SS Daniel Chester French. The French sailed from Philadelphia with a destination of Dandar Shapur, Iran and was carrying a lend-lease cargo of vehicles and ammunition for the Russian Army when they were given a course, in error, into an allied mine field in the Mediterranean Sea off Tunisia in North Africa. At 0720 on the morning of 6 March 1944, Sproul’s ship hit a mine creating two large explosions, causing the ammunition cargo to explode. With the ship in flames, the crew and 87 Army passengers abandoned ship in the 10 minutes before the Daniel Chester French went down. Sproul and 3 other Navy personnel and 9 merchant marine crew were lost. Rest in Peace Signalman 3rd Class Kenneth Allen Sproul, Lat. 37 17’N; Long. 10 22’ E 30 miles off the coast of Bizerta, Tunisia. Sproul was 20 years old and will be remembered today at a Memorial Day Program at the American Military Cemetery in Carthage, Tunisia where his name appears on the Memorial Wall of the Missing. Joe Sproul Jr. for the family received the State of Maine Gold Star Medal in remembrance of the ultimate sacrifice of Kenneth Sproul. George Cropley receives the State of Maine Gold Star medal for the loss of his father, PFC Errold Hastey KIA in Italy in 1944. George is our only Sons of the American Legion (SAL) member. More than 70 years ago, a generation of men and women rose to the challenge of defending freedom. Their service and actions taught us about courage, sacrifice and loyalty to our country and to their comrades. The “Greatest Generation MUST NEVER be forgotten. By attending today’s remembrance, you are called to pass the word – FREEDOM is NEVER FREE! Freedom! We take that simple word so casually but we must never forget that it was paid and is still being paid for with the blood, guts and sacrifice of our military. Today marks the 70th anniversary of the official end of the greatest battle ever fought by American troops – the Battle of the Bulge. That 5 week battle cost us 10% of our total casualties of the four and a half years we fought during the Second World War. With each passing day, week, month and year, we are losing tens of thousands of our men and women veterans who provide us with a personal link to those dramatic and heroic times of their service and sacrifice. It is therefore up to us, their heirs and descendants to “Remember – Honor and Teach” so that their legacy of Freedom will never be forgotten. Last summer, I was in France with 30 Washington County young people who were singing as part of the Washington County Children’s Chorus in concerts at castles and cathedrals for 10 days. The most moving was their performance in a little village destroyed by the Nazis after the men and teenage boys were murdered. Our kids sang two pieces in French to the memorial program at the cemetery. French TV was there. The tears flowed, especially from the older folks who remember what the French call “Liberation Summer – 1944”. Many came up to me and others to express their gratitude for the sacrifice of so many of our young soldiers liberating them from Nazi Occupation. A number of years ago, I was in Luxembourg to watch dozens of young children placing an American Flag and a Luxembourg Flag and a red rose on each of the thousands of American graves there in the American WWII Cemetery in preparation of Memorial Day. I was told that they wanted their children never to forget the sacrifice of those young soldiers. The Battle of the Bulge – the Christmas they never got to celebrate. This tree stands here in solitary memory of what happened between Dec 16, 1944 and Jan 25, 1945. The allies had liberated France and were in Holland and Belgium ready to cross the German border and end the War. Many thought that the war might be over by Christmas. Allied troops had slowed down and the commanders became complacent and over confident. Hitler had other plans – a top secret plan. The Germans moved a huge force under cover of night and radio silence to the borders in the Ardennes mountain region. The plan was to catch the allies by surprise and split the allied line dividing the Americans in the South from the British in the North. The Germans would drive through to Antwerp, Belgium and force the allies to negotiate a peace. We were completely caught by surprise and over run by massive and well equipped German forces backed up by hundreds of tanks. During the first 2 weeks, our troops performed heroically delaying and holding off superior German forces. The sacrifice of the 394th Infantry Reg, elements of the 9th AND 10TH Armored and the 28th Division during the first few days made it possible for the 101st Airborne Division (Remember Band of Brothers?) to retreat to Bastogne, that vital village in Belgium that controlled the rail and cross roads blocking Nazi drive towards Antwerp. Many of us know the story of Bastogne and how American General McCauliffe gave the finger to the Germans when asked to surrender. It was Christmas, 1944 in Bastogne but no Christmas for the thousands of troops battling the German forces that surrounded them and often times were in the same buildings with them. It was hand to hand, close combat of the most vicious but our soldiers prevailed. Cooks and clerks fought for their lives as Infantry. The weather! Oh the weather! It was one of the coldest winters on record. The snow was fierce and blowing with no hope of air support – planes were grounded. They were running low on food and, especially water because their canteens all froze. Eating ice if you are already suffering frost bite and hypothermia doesn’t help. Our troops did not get a change of clothes, shower or anything like that for a month. Their uniforms were in tatters. They were always running out of ammo. 23,000 were captured and many died on the way back to Germany. In one notorious incident, SS Troops machined gunned down almost a 100 American POWs in the Belgium town of Malmedy. The defense of Bastogne by the 101st will always go down in American Military history as remarkable. In the end, the line “Bulged” but never broke and it cost the German Army tremendous loses in the end that paved the way for the invasion of Germany and the end of the War in May 1945.